Use this fall hiking clothing and gear guide to extend your customary hiking season by a month or two. The guide lays out how to choose the best hiking clothing and trustworthy hiking gear so you stay warm, dry and comfortable through the changing autumn weather. It can also be used for tackling spring time trails, or for three season car camping. Keep it handy! Dressing in layers guarantees optimal comfort during fall hiking, but you might need a few hints on how to choose the best pieces for your layering system. Adding a few things for comfort and safety to your ten essentials list is easy - without adding a lot of weight to your backpack (or breaking your budget). Trail footwear that served you well on warm, dry summer days? Reconsider it to preserve your safety and comfort on wet, muddy autumn trails. Hiking For Her is a proud affiliate of REI Co-op, meaning the images on this page take you to their hiking clothing and gear. You pay nothing extra when you purchase using the links. Hiking For Her receives a small commission. for some great fall hiking! Sure, you can grab a hoodie from your workout gym bag, or dig through the house clothes pile to snag an extra shirt before you head out to the trail head. But a smart hiker facing cool weather trails (that's you!) makes very deliberate choices about fabric, weight and design in order to maximize the chances of a safe, enjoyable hike. Let's start with the basics: your best base layer choices. Don't include your sports bra and underwear in what hikers call your base layer. Maybe those are the sub basement layer?? Instead, think about what goes against your skin, on top of your undergarments. You want it to feel good, but work hard for you as you work up a sweat. A long sleeve top with a relaxed neckline is an ideal choice for your moisture wicking base layer, if it's made of the right material. This shirt is meant to fit your form. If you like a looser base layer as this woman does, order one size up. Fall hiking weather can be tricky. A day can start out dry and fairly warm, and then turn on the water spigot. Or the opposite scenario can play out: you dress appropriately for a cool rainy day but half way through the hike you're cooking from your body heat trapped in your hiking clothes. Choose fall hiking clothing that allows you to uncover and cover as many times as needed during one hike. A versatile choice for a midlayer to layer over your base layer long sleeve shirt is a zippered hiking vest. This lightweight hooded vest performs well in damp conditions, thanks to ripstop nylon and a durable water repellent (DWR) finish. Hood zips down into the collar so you can get it out of the way when you don't need it. This vest can double as a warm cushion & moisture barrier on top of a wet backpack when you sit down for a snack. Your second vest option: do what the birds do and harness the power of down. This REI Co-op Women's Down Vest weighs just a hair past 6 ounces!! And it packs into its own pocket, for easy stowing in your backpack. Word of warning: lovely hiking vests like this one may begin to accumulate in your gear locker. It's okay, it happens to us all eventually. Chances are all of the hiking will work up enough body heat to keep you comfortable, but some women end up shivering despite the rigors of the trail. A pair of leggings or tights as a base layer beneath your pants will keep your legs cozy - but give you plenty of flexibility and freedom of movement. You can also sleep in a clean pair of these handy leg coverings if you're on an overnight or longer backpacking trip. Take a look at some viable options for fall hiking mid layers. Intrigued by the idea of striding down the trail in a skirt? Some female hikers find tights too thin to do much good in terms of trapping body heat. And sometimes too see through (revealing) to be suitable for the trail. In particular, these ROYAL Step Up 7/8 Leggings available at REI Co-op, for lots of reasons! Or read my review of prAna Pillar 7/8 leggings! Keep your leggings and tights from wearing out too quickly by line drying them. The heat of the dryer will encourage them to lose their shape, too. Never underestimate the value of a warm hat and weatherproof gloves for your safety and well being on fall hikes. This tip is so important that you might want to add these nearly weightless but priceless items to your hiking ten essentials, and carry them year round. REI Co-op Fleece Beanie is a close fitting head cover to keep your body heat locked down. Too cute to use it just for trail days! Hiking gloves come in an entire universe of choices. Let's make this easy on you. Here's the pair just right for this fall hiking clothing and gear guide: REI Co-op Wind Pro Fleece Glove. Your jacket and pants are your outer layers. You may feel overwhelmed by all of the choices you face. 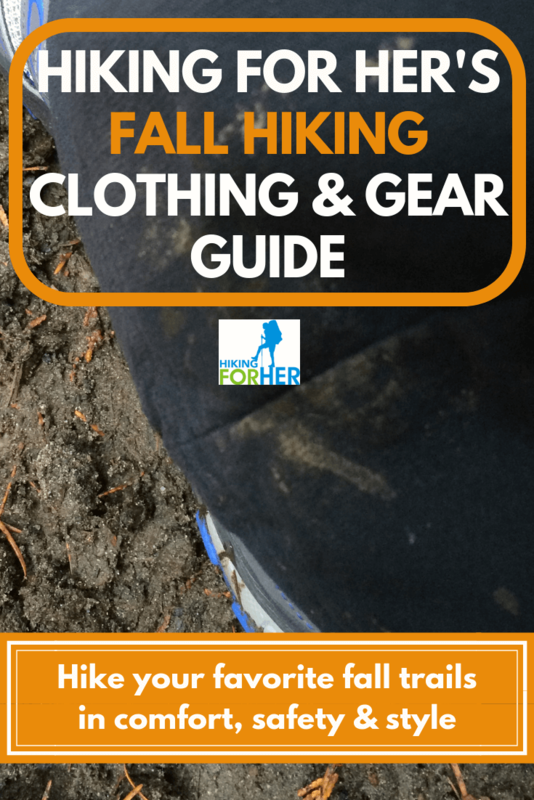 That's why this fall hiking clothing and gear guide includes recommendations for you! You've gotta love fleece for its ability to insulate your body while keeping moisture and wind at bay. This REI Co-op Women's Fleece Jacket is super affordable, and so handy on (and off) the trail. Fleece can stand up to moderate amounts of drizzle and still keep you warm, perfect for fall hiking weather. In a jacket, look for chest vents (diagonal small zippers you can open and close as needed) and pit zips (yup, right where you'd expect from the name). Inexpensive hiking clothing usually does not have the added feature of venting options, so if you're a beginner hiker doing fall hikes you might have to work with your mid layers to keep yourself temperature regulated. Pit Zips!! We love pit zips!! Water repellency does not mean that all moisture will be kept away from your skin. Instead, expect the fabric to dry quickly, and to provide some protection against skin chafing if it gets wet. Convertible pants are great for the weeks in between summer and full on fall, when days may still be quite warm but skies can cloud up quickly. Having pants that convert to shorts, and back again, give you the versatility you need to stay comfortable and protected when the weather forecasters tell you big fat lies optimistic stories. Do I really need rain pants? Over the five decades I've been hiking, my answer has evolved to an emphatic YES, you do need rain pants in your backpack if you're on a fall hike and the trail head is more than a mile away from your destination. let's get to the gear! The hiking Ten Essentials are really clear on what to bring to keep yourself as comfortable as possible while remaining safe on a hike that goes sideways on you. But consider them the bare essentials. For less than ideal hiking conditions, or days when the weather forecast is a bit dodgy (which describes fall hiking, doesn't it!) you need to add some things to your pack. That's why they're included in your fall hiking clothing and gear guide! A lightweight tarp can be used to sit on when there are no dry options but someone has to rest. You can pitch it overhead for a rain shelter or wind block when someone is injured or ill on the trail. And a thin, almost weightless space blanket (shiny reflective material) can trap precious body heat when you have to spend the night out of doors. Carry protection against elements + warmth for less than $20 US, with an all-weather blanket like this one. And I'm sure you can see how to use this tarp when car camping, or to provide a protected sitting spot during a picnic at the park. I carry one in the car, too, because you just never know! If you hike with a trail buddy, human or canine, it's neighborly to offer them a dry place to sit, too. Shorter, possibly dim or foggy daylight hours work against you on fall hiking adventures. Stumbling around on a slippery wet trail in the dark is asking for trouble, in so many ways. If you have ignored the wisdom of the Ten Essentials, now is the time to add a headlamp to your backpack, and make sure it's got enough battery power (juice). If you've never gotten really wet and cold on a windy, exposed hiking trail, you might be surprised at how quickly hypothermia can set in. One way to keep your internal temperature in the ideal range is to consume hot beverages before and during your hike. A lightweight, fast option to boil water is a JetBoil Flash Java Kit. They make it mighty easy to brew up a cup of anything, anywhere along the trail. Fill up a Hydroflask insulated bottle with the hot beverage of your choice before you hit the trail, and enjoy a cuppa before you step away from your vehicle. Or stash a bottle for when you return hours later, cold and damp and achy! You can do even more to up your enjoyment of fall hiking trails. And the best part about these recommendations conveniently pulled together into your fall hiking clothing and gear guide? You can re-purpose them for car camping, spring hiking, and travel plans. On a fall hike, you will lose body heat through your uncovered head and bare hands, but we've already got you covered with the recommendations above. You will also lose body heat when sitting on the cold ground, or while perched on a handy but (wait for it) stone cold rock along the trail. Why not carry this little self inflating cushion, and always know that you'll be comfortable when you sit down on a hike? Take this gear with you when you travel or car camp, to customize your lumbar support and cushioning. If you're a hiker who prefers the least amount of weight possible on your feet, the mud puddles and slick rocks of fall hiking trails might change your mind. Your lightweight, minimalist trail shoes can't be expected to protect your ankles from rock abrasions or spattering mud. And low cut boots with sketchy tread aren't going to stand up to full blown rain storms. Which is simply a way to say that the information and trustworthy recommendations in this fall hiking clothing and gear guide hand you a neat and tidy roadmap for safe, happy fall hiking.